If the recent spate of regional Marketing Technology Landscapes are anything to go by, our old mate Scott Brinker has a hefty task on his hands collating the logos this year of each and every marketing technology platform available to the modern marketer - the numbers of which are somewhere in the vicinity of a gazillion…probs. With each version, we’re often presented with 100s of vendors which didn’t make the cut in Brinker’s most previous edition – either from accidental oversight, or the platform having been released after the graphic was compiled. Our own UK version unearthed an additional 100 vendors, Finland 117, Germany a huge addition of 220, and now this most recent effort has presents us with 154 martech vendors, of which 126 were not previously featured in Scott’s landscape. As we wait with baited breath for Brinker’s 2019 Marketing Technology Landscape Supergraphic: Martech 5000 which is traditionally unveiled at the San Jose MarTech Conference (3 – 5 April) the legendary team at Finnish agency Avaus have gifted us a little snack to sate our hunger. 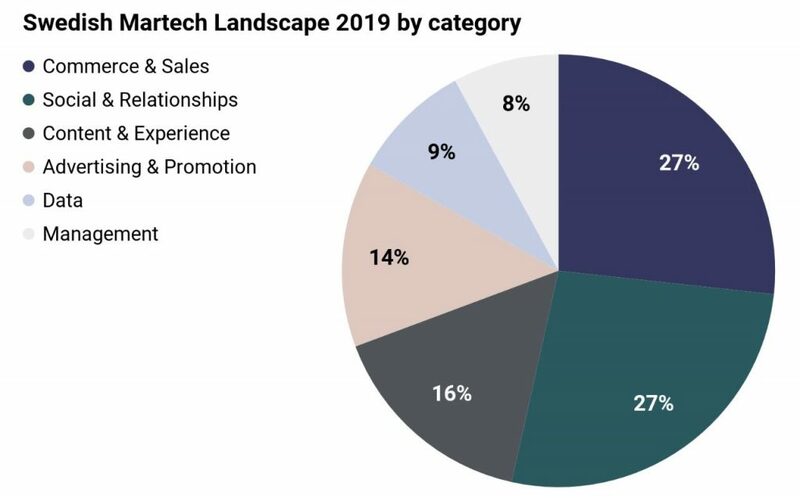 “This is the first systematic study of the Swedish landscape, revealing total investments of almost one billion USD in the martech segment” said Mika Bäckman, the Consultant at Avaus who led the study. The two largest categories are Commerce & Sales, and Social & Relationships combined covering 54% of all identified companies. Quick recap of the regional (plus one for the inception of blockchain and martech) editions we’ve seen to date…if we’ve missed any give us a shout in the comments! 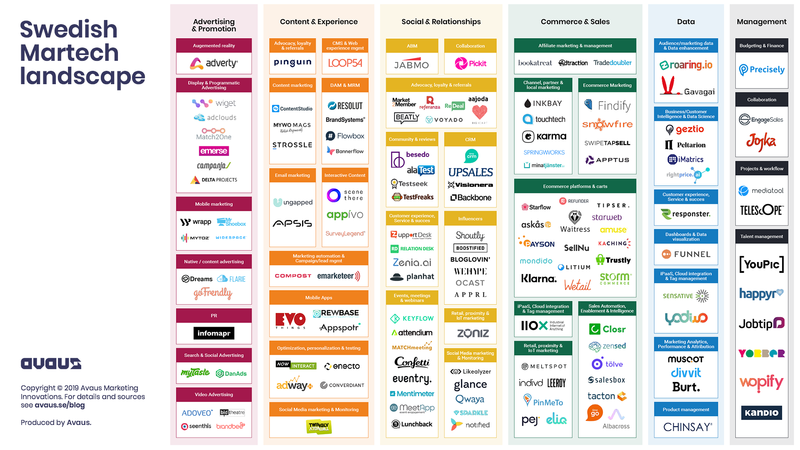 Ok so as we sit on the Brink-er (#sorrynotsorry) of another monumental Supergraphic we turned to our illustrious founder – the Prince of MarTech (he haaaates it when we call him that) Carlos Doughty for his predictions on the state of the impending Supergraphic.